In a dramatic turn of events, two of Ghana's glamorous clubs, Kumasi Asante Kotoko and Accra Hearts of Oak sack their Coaches in the same week. The Capital based side were the first to sack their Coach when they parted ways with Frank Nuttal on Thursdays following his role in the departure of some of the clubs key players. 24 hours later, their bitterest rivals followed with the sack of English Coach Steve Pollack. 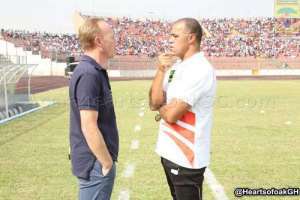 The Phobians initially suspended Nuttal after he was involved in player transfers without the knowledge of the club. A three-member committee was set to investigate matters before he was finally shown the exit door on Thursday. Frank Nuttal had endeared himself to the fans of Accra Hearts of Oak after bringing the best in some fringe players, leading the team to finish third on the table and were runners-up in the MTN FA Cup. Meanwhile, Kumasi Asante Kotoko sacked Steve Pollack following the clubs failure to go beyond the first stage of the CAF Confederations Cup. On arrival of the club, reports from Kumasi indicated management had meetings with the gaffer and following that, the Coach was sacked. Steve Pollack joined the Porcupine Warriors midway last season, helped the club finish 5th on the table and were winners of the FA Cup at the end of the season. This is the first time Accra Hearts of Oak and Kumasi Asante Kotoko have sacked their Coaches in the same week.